Join us on a private tour to experience on e of the greatest wonders of the world. Niagara Falls. Start the day of in a personalized vehicle, providing style, comfort and class. Tour around Niagara Falls with your private guide, and take a ride atop the Skylon Tower to get Breath-Taking Views of Niagara Falls. Enjoy lunch in Niagara Falls, Niagara on the Lake or a farm to table restaurant. * Lunch Not included. Depart from your hotel at your convenience in a luxury SUV accommodating up to 6 passengers. Travel 90 miles to Niagara falls with your driver also your tour guide. Looking for local insight or hot spots, we have you covered. 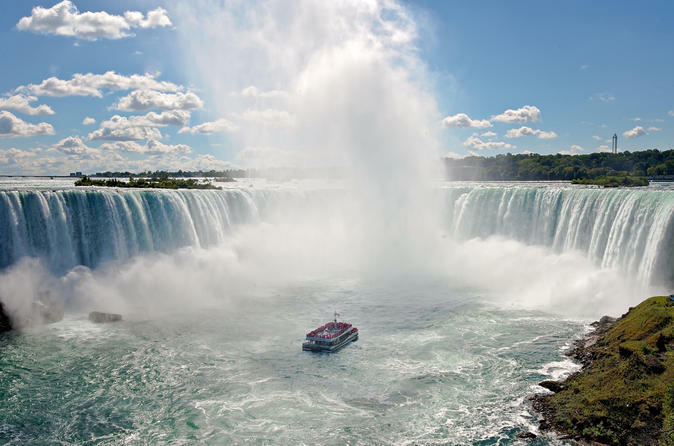 Allow your personal guide to get you up close to the Canadian, American and Horseshoe falls. Free time will be allotted for self-exploration if you wish. Remember this is your tour, we design it to your requests. We will travel down the parkway to see some of the highlights of the region, including: Admission atop the Skylon Tower Whirlpool rapids; Power Generating Stations; Floral Clock; Queens-town Heights; and Fort George leading up to Niagara on the lake. We will even take you behind the main town to view the lake and some exquisite Victorian and Georgian homes. We will finish the tour with private wine tasting at the winery in the Niagara region.